So, It’s been a while! I’ve been back on two wheels for a couple of weeks now after been stuck in Almaty for a whole month! There are definitely worse places to be stuck and I was lucky to be surrounded by great people and beautiful places however it was still very frustrating. My bike needed a new clutch (kindly sent out by Ducati North America!) and two new valves. Unfortunately it took forever to get the valves sent out. Ducati Almaty prioritised me at every opportunity and, when the parts arrived, got them fitted as soon as possible. I’m so grateful to all of the people I met in Almaty for their hospitality and generosity, the acts of which are too numerous to list! 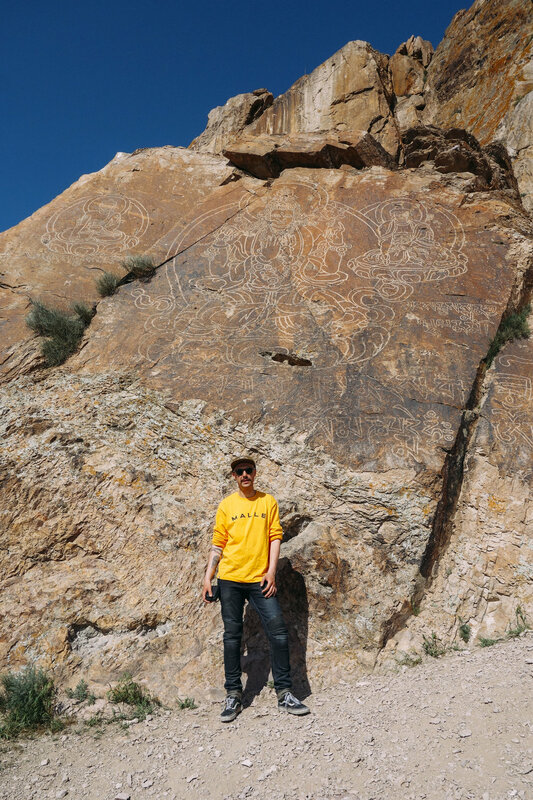 A trip to the rock carvings with Dima and Polina - we had to ride off road for a while to get to the site which was great fun, after looking at some of the carvings we climbed one of the large hills and took in the view. There was a big castle built there for the movie ‘Nomads’ which could also be seen across the river. Visits to the mountains - Vladimir took me to Shimbulak Ski Resort, we had hoped to snowboard but it had been raining and as it is the end of the season the slopes were very icy. We settled for a mulled wine and enjoyed what we could see from the gondola, which wasn’t much because of all the clouds! A ride/hike to see a waterfall - This was another trip with Dima and Polina, we rode to a national park where we walked a couple of miles to the waterfall before heading back down, catching some dinner at a trout farm and eating ‘Kazakh fish and chips’. The ride back was stunning, with the sun setting and petals blowing off of the trees. Visiting the lakes - One of the many lakes around Almaty, apparently they are all different colours! Watching practice days at Sokol racetrack - Ducati Almaty offer track days at Sokol, an hour or so out of the city. It was great watching the riders and we even had a couple of GoKart races which were fun. I’m happy to be back on the move although I have had to retrace my route through Kazakhstan for almost two thousand miles. Originally I had intended to travel down through Uzbekistan then Turkmenistan and into Iran. Turkmenistan did not respond to my visa submission; Apparently it is the second hardest country to obtain a visa for after North Korea and has a 70% rejection rate. So, a change of plan! I’m currently on a boat across the Caspian Sea to Baku, Azerbaijan, from Aktau, a town in western Kazakhstan. luckily I arrived just in time and did not have to wait long for a boat (they don’t have schedules). On my way to Aktau I stayed with Rinat who was a great host and took me to a Motorcycle Festival on the outskirts of Baikonur, this was great fun but having had little sleep the night before and arriving late in Aktobe the next day meant I was super tired and started to make mistakes, little things like forgetting to put earplugs in when I rode and bigger things like losing my glasses and starting to fall asleep while riding, assisted by the endless and unchanging desert in front of me. Central Kazakhstan is also very windy which made riding strenuous. I was able to get new glasses in Aktobe and was grateful for a good nights sleep in Uralsk. I also had my first puncture when attempting to leave Atyrau for Aktau, I managed to repair it in order to get back to Atyrau but the tire was already damaged. I’m very fortunate to have made great friends in Almaty and Dima sent a new tire overnight as there were none available in my location. I had stopped at a garage/engineers with a bike parked outside and asked them for help locating and changing a tire, Alexander was endlessly helpful. He drove me around the city looking for a tire and when we couldn’t find one helped arrange delivery with Dima and then collected the tire from the airport at 5am! Once the tire arrived he took me to a mechanic who could fit it. Nobody would take payment for their assistance or work. This is a characteristic that repeatedly astounded me in Kazakhstan; unimaginable kindness. I eventually reached Baku after days on the ship from Aktau, we had to wait outside the port for a day until another ship left, we got off of the boat at about 9PM and I didn't clear customs until 1:30AM after paying some extortionate port charges and even a fee to use the ramp getting off of the boat. This being said everybody at both ports and on the ship was so friendly even if the process was as confusing and long winded as possible. I entered Iran a couple of days ago and have been enjoying the amazing scenery, buildings, food and people so far. I'm looking forward to the next few days and my onward journey into Pakistan! I will try not to leave it so long between updates next time! Battling the Beast from the East! Today I arrived home safe and sound with a Ducati Scrambler ‘Desert Sled’ after a two day battle with the beast from the east! Having never ridden this bike before me and cinematic extraordinaire, Emma Hiley, drove up to Silverstone Race Circuit on Thursday (1st March) and I attempted to ride the bike 125 miles back home. The roads were really not ideal and there were a couple of hair raising moments. The tarmac on the M40 had either been crushed or exploded due to the temperature dropping to -6 degrees celsius. The obstacle was unavoidable and I went over a mound of concrete and rock sticking out of the road. The bike went a bit sideways but I managed to stay on top of it and we carried on. We had issues with freezing screen wash in Emma’s car on the way there and the way back and, after stopping in Beaconsfield to clear the windscreen, we decided the weather had become too bad to continue riding in. After I secured the bike, we hopped in Emma’s car and drove back to stay at hers. I was very generously offered a lift to collect the bike this morning and managed to ride it home without a hitch! I can’t wait to start the world tour on this machine! Follow my journey on Instagram/Facebook/Twitter using the buttons at the bottom of this page. Thanks for checking out the project - I am going to be updating this blog page in the lead up to my departure as well as whilst I am travelling. Be sure to check back for the latest developments. If you want to see more you can follow me on Instagram @henrycrew (www.instagram.com/henrycrew).